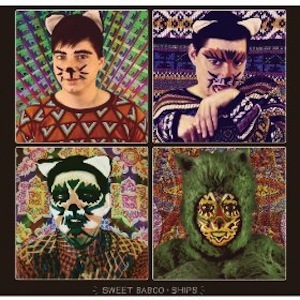 Ships is the newest entry in the canon of Sweet Baboo. Stephen Black, (aka Sweet Baboo), singer/songwriter/producer/all around man about town, taps into a line of Welsh artists stretching from John Cale to Super Furry Animals, Gorky’s Zygotic Mynci and Cate Le Bon. In between spending last year gigging around with Slow Club, he found time to follow up 2011’s I’m A Dancer/Songs About Sleeping with this whimsical collection of horn-spiked indie pop. It’s a kitchen-sink production, but pleasantly so, laden with an abundance of nautical references. evocative portrait of longing, was the leadoff single, and the Casey Raymond directed clip (viewable below) is what Black terms “a Louis Wain inspired psychedelic cat video.” Other winners are “8 Bit Monsters,” “You Are A Wave,” and the heartwarming closer, “Cate’s Song.” All told, Ships is a voyage worth taking.